The Made in France adidas Superstar has a hallowed status. We’ve seen the provenance of a shoe become an issue with increasing prices over the last few years on Asian-made product, meaning a European or American made shoe might justify its wild price a little. For most, the Superstar 80s shape is a favourite — anyone who came up with any b-boy leanings in the UK will have had some experience with this model in the early 1990s, after production exited Europe, making old examples into collectibles — the enterprising folks of Duffer, Passenger and Acupuncture knew how to turn US deadstock in some sports store basements into a lot of money. Given the different licenses behind the shoe, we’ve tried to work out some historical context on this version of the shoe. With the original Superstar shape only hitting the German market in 1972, despite the model debuting in 1969 in the States (on players) before spreading to non-pros the following year, France (presumably as a result of Horst Dassler’s work away from home) was a key country of manufacture. The shoe got its gold tongue branding during the 1970s and we think that the change in shape that accommodated an American foot may have been around 1978 rather than in the 1980s. The need for more and more footwear manufacture, and some deals between France and Eastern European countries meant that many of the actual Superstars of the 1980s were made in Hungary. The dawn of the adidas Superstar II (not to be mistaken with the short-lived Superstar II, with a non-rubber toe, from the late 1970s) around 1991 meant that we could barely get the real-deal for anything approaching a reasonable price. And don’t get us started on those heavily padded things with the metal eyelets either. We thought that we would never be able to take much of an interest in the Superstar post Superstar 35. 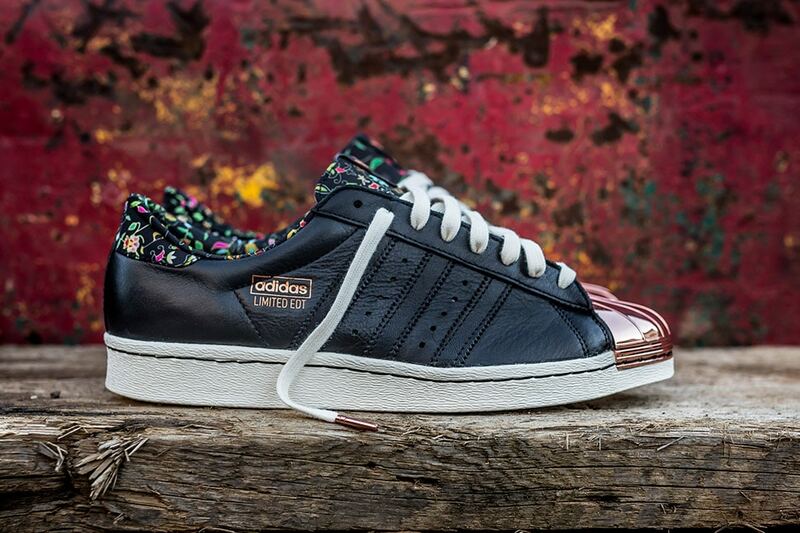 The drop of the Superstar 80s in 2008 was a benchmark move though, and adidas Consortium taking it back to the Dettwiller area of France and manufacturing a limited amount in the Ateliers Heschung factory where a few classics have been made before is a perfect way to celebrate another anniversary for the shoe. The quality here is phenomenal — the leather and the construction is first rate, representing la marque aux 3 bandes flawlessly. The blank heel, tan lining, sticker on the sockliner and cracked tongue logo looks great. Even the box is on point. Just like the German-made Munchens a few years back, these are a class act. If you like shell toes, you need these. At 172 pounds they aren’t cheap, but they’re not overpriced in the slightest and an opportunity to get one of the most important shoes ever made made the way it’s meant to be is a rare one. Or, to put it all in perspective financially, you can go spend a similar amount on some neon Foamposites. Some are gonna pick the former and some are gonna pick the latter. We’ll be opting to spend our cash on the Gallic factory’s output. One of the best releases of the year and dropping online in very limited numbers this Friday.